Rod and Amy Burkert didn’t intend to start a pet travel business together, and they definitely didn’t intend to conduct it from an RV. But when they discovered how tough it was to find places to stay with their two dogs, one a German shepherd mix, they decided to share the information with others who faced similar challenges. And GoPetFriendly.com was born. It was an idea whose time had come. According to recent PetRelocation.com survey, some 60% of owners traveled with their pets in 2010, and 78% of them chose hotels for their pet-friendly policies. In addition to information about lodgings, the Burkerts also include dog parks, beaches, attractions, and restaurants in their data base. That ever-growing pet travel data base is the backbone of their website, but the heart of their business is their blog, Take Paws, promoting such causes as taking responsiblity for picking up after your pet and ensuring your pet’s safety in a car. Opinions about such issues as what makes a destination genuinely pet friendly, as well as input from readers who follow their journey, make the site a kind of Trip Advisor for the furry. The Burkerts’ decision to travel with their dogs full-time led them to sell their homes and buy an RV, surprising many who associate this mode of transportation with retirement — including themselves. To learn how this active pair came to go against the stereotype, read Rod Burkert’s post, RVs: A Great Way to Travel with Pets. The Burkerts worked at home together in their previous occupations — they call themselves “recovering accountants” — but that’s different from having free-form days to fill, with the shifting circumstances of pet travel constantly posing new challenges. In this interview, they reveal how they managed to adapt, from figuring out how to collect their mail to working out a system wherein they state — and rate — their activity preferences. “I don’t care” is not an option. It’s a fascinating model for all types of relationships, with or without pets. This entry was posted in Edie Jarolim, Pet Travel and tagged GoPetFriendly.com, pet travel, RV Travel on May 16, 2011 by Edie Jarolim. Traveling by an RV is a great way to take a vacation and be able to bring your pets along. 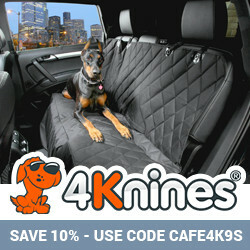 It saves money and the aggravation of trying to find pet friendly hotels. 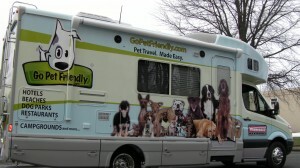 Their are some great ground shippers that use RVS for transporting pets. Such as http://www.pettransport.biz and http://www.animaltransportation.net Also http://www.petrelocation.us is a good one as well. Whole family will travel across world by having RV as it is cheapest source of communication along with the family enjoyment. Business will be done in easy mode as what require is training to run this as bulky according to business and family size. We now continue to travel seasonally with our new three legged dog Wyatt, working from the road to maintain the Tripawds Blogs community and discussion forums via satellite internet. Love being able to travel vicariously with them. Great story! Now if we could find an RV that would include the whole farm we could go too! I think it is great that places are understanding the wonderful relationship between humans and animals and that having to part at vacation time is stressful for all parties.